This time there were too many workers to count.Â The construction manager confirmed that there were 55 guys on site that day! Â Look closely at the picture and youÂll see why they hired so many workers for the day.Â The entire floor had to be completely poured in a single day. Notice the lines of guys. They actually set up two bucket brigade lines - one for each side of the building. This was required in order to complete the pour in one day. Â Each line extends from the cement mixer up to the 2nd floor. 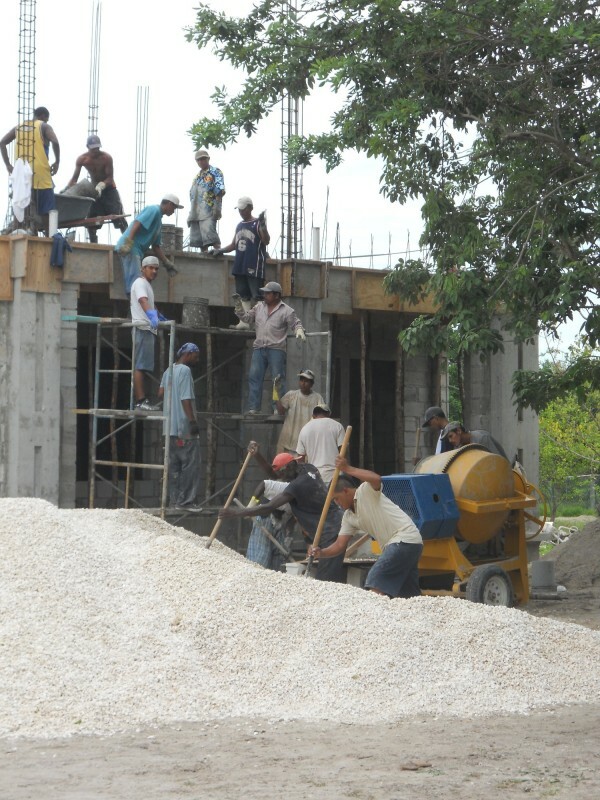 Â The workers loaded buckets with cement. Then they passed each bucket up the line, to the second floor.Â Then it was dumped and evenly spread across the floor. This is demanding physical labor, performed under a blazing sun.Â August and September are the hottest, muggiest months of the year on Ambergris Caye.Â When the wind dies down, the mosquitoes are at times fierce. That was the case on Thursday, when the floor was poured.Â God bless these local construction workers. Â They started at 5:00 AM and worked from dawn until after dusk (around 7:30 PM).Â They couldnÂt stop until the job was done.Â They deserved more than a few Belikin beers that day! On Friday morning (September 9th) we woke up around 6 AM. The workers would be arriving at their normal 7 AM time that day.Â So we scrambled up the partially finished staircase, to check out Building AÂs finished concrete second floor.Â I was able to snap a few shots before the workers arrived. A few weeks ago the panel shipment arrived. Â It took a while to get these special construction materials, since they were coming from outside of Belize. Â The Building A walls and floors are now being built with a specialized approach to construction, that I'll describe below. I am not aware of any other condominium development on Ambergris Caye that is using this M2 technology.Â My husband Mike used a similar precursor technology Â Covintec Â to build the San Pedro Club building, pool, and the duplex we live in on the Baymen Garden site.Â We have been very satisfied with the Covintec product, especially the sound proofing and insulating properties. This specialized panel construction was chosen because of its track record for strong results. 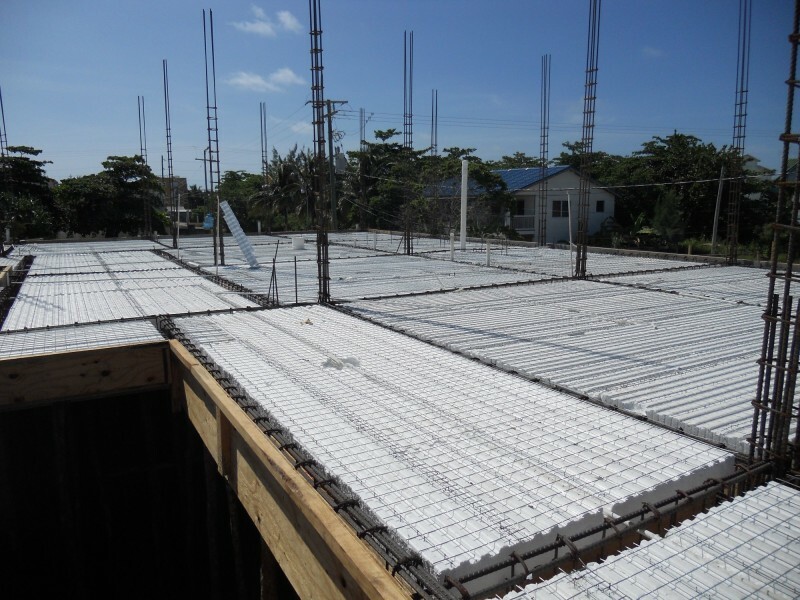 This system, if applied with the appropriate panels and building technique, provides a building that is energy efficient, and resistant to hurricanes, fires and seismic events. The panels are known for their high insulation and acoustic attenuation properties. 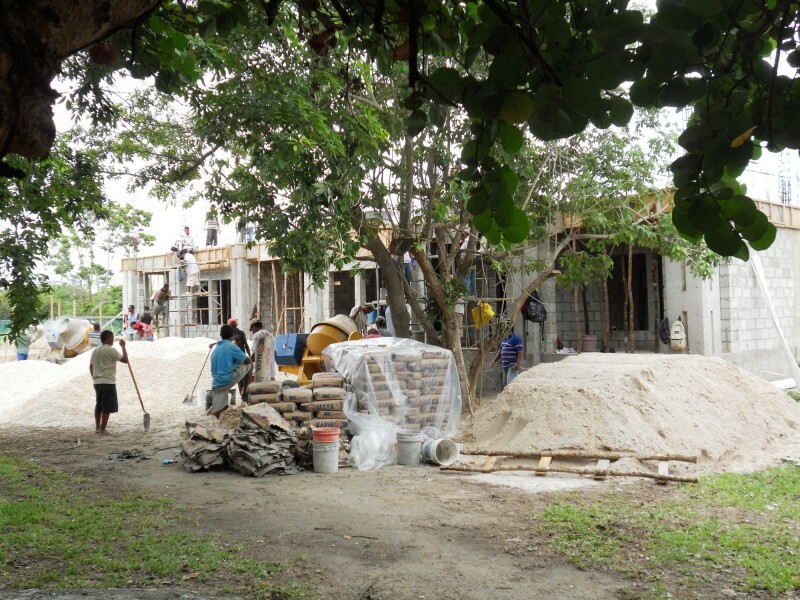 They provide advantages not found in the more commonly used materials in Belize:Â block, drywall, and wood.Â Although block and drywall are adequate for hurricanes, these panels provide a broader range of advantages than block. The panels can be used for both walls and roofs.Â The base element of the building system is a modular panel composed of two electro-welded galvanized steel meshes. The steel meshes are reciprocally joined by connectors. In between is a shaped foam polystyrene plate. The panels are clipped together and then sprayed or coated with concrete. Once the concrete is applied, the structure is strong in three dimensions. The base element of the building system is the foam polystyrene, suitably shaped, used both as a disposable form and as an insulating layer. The neat thing is that these panels can also be shaped to form rounded surfaces. Once the panelsÂ have been installed, they are anchored and finished with the application of light concrete on both of their sides. 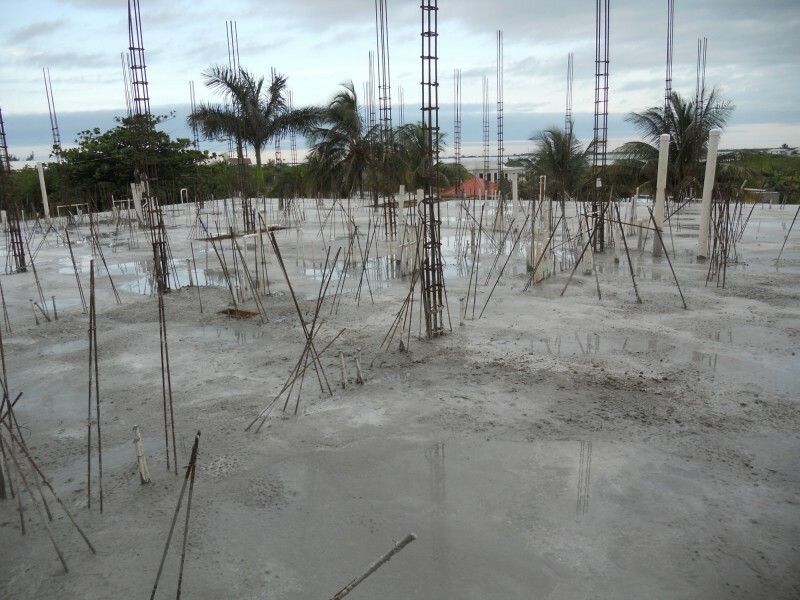 In this way we have the advantage of a building that has load-bearing walls consisting of two reinforced concrete plates with an integral thick network of connectors, and an insulating core. 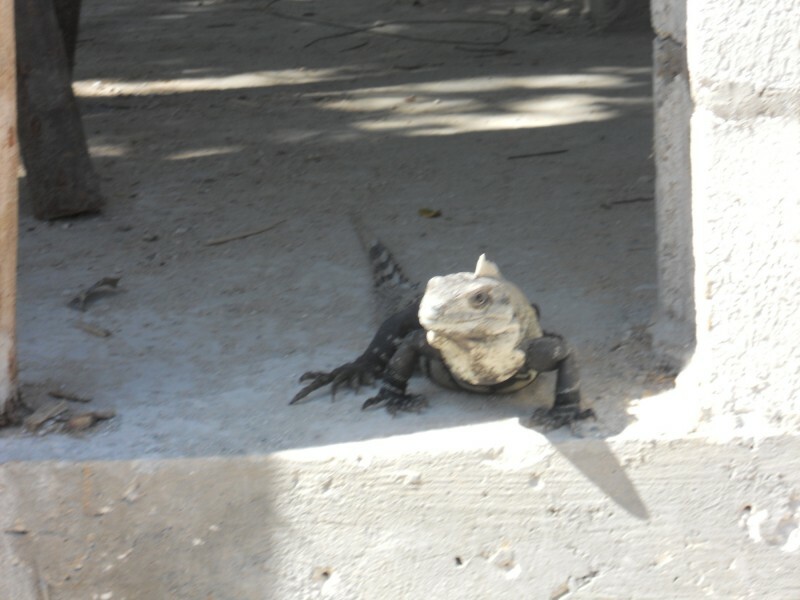 The Baymen Garden property is a refuge of sorts for these protected iguanas. They are harmless creatures, and often entertaining. Visitors are welcome anytime. Â Just contact us to set up a private tour of Grand Baymen, the Baymen Garden development, and the San Pedro Club.